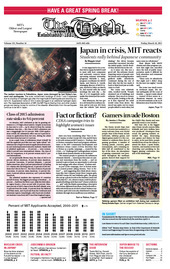 The nuclear reactors in Fukushima, Japan, were damaged by last Friday’s tsunami and earthquake. The outer containment buildings of Units 1 and 3 exploded due to a buildup of hydrogen gas after the magnitude 9.0 earthquake and resulting tsunami hit. Suppression tanks at Unit 2 were damaged in an additional hydrogen explosion. The Japanese Association of MIT, the MIT Figure Skating Club, and other student groups are raising money for victims of the disaster. Aftershocks from the earthquake continue to be felt in Japan.